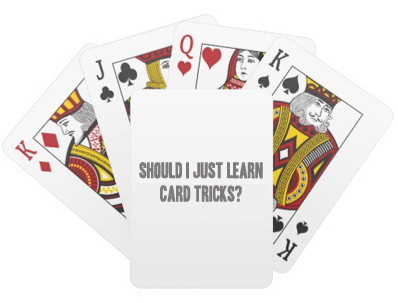 Should I Only Learn Card Tricks? 'I'm quite a good card magician. I'm no Lennert Green, but more than competent. Should I continue to learn card tricks and become the best I can be at it. Or, should I branch into other areas of magic & become a good all rounder? Why are you learning magic? Is it to go out and perform or simply for the love of learning? If you want to perform, your selection of material should be based around the ACT you want to present. You really don't need a lot of time each day to set aside for effective magic practice. The secret is short, frequent, and focused sessions. Take a look at this advice about creating a practice drill program for your magic. When you perform card magic tricks, are you tempted to add in additional cuts and flourishes to demonstrate your skill with playing cards? These demonstrations of skill can delight audiences, and quickly establish you as a competent magician. However, it's important to understand that even the most advances and impressive playing card flourish could hurt the dramatic impact of a card magic trick, if it's used in the wrong place. So, when is it the right time to perform flourishes with your cards? After all, these moves take considerable time and commitment to master. Dominic suggests that the best time for these demonstrations is BETWEEN your tricks, rather than when you handle the playing cards during an effect. 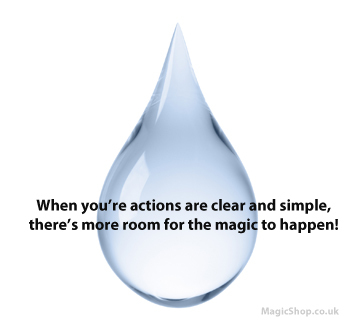 Anything that is unnecessary to moving the magic trick forward to it's conclusion is reducing the clarity of the effect for the spectator. The playing cards or deck of cards should be handled as little as possible, and with clear movement and minimal action. By avoiding flourishes and trick cuts as you shuffle and handle the cards, you reduce the possible 'points of method' that the spectators can jump on as the moment something sneaky took place. Using demonstrations of card manipulation as you move from one card magic trick to another may work much better. It can help create a flow and pace to bridge between your individual tricks, keep the spectators engaged, and also appear to be magical events in their own right. By making your flourishing separate and distinct from your tricks, you avoid the flourish being mistaken for the mechanical method of the trick you are presenting. Should I use Bicycle Playing Cards? Nice thinking Howard, you’re 100% right about sticking to Bicycle Playing Cards because you need to become familiar with one standard size and feel of deck. However, Bicycle make playing cards for just about all the leading magic playing card designers. So, if you want to use NOC Playing Cards, Ellusionist design playing cards, Blue Crown playing cards etc, you will be fine as far as muscle memory and feel. You might want to check out the post about the difference between playing cards. Trouble with your Double Lift. Take a moment to study how the move looks when you just do a single lift. That’s what you want to copy. Avoid methods that look odd, such as twisting the playing card as you turn it. Grab some bicycle playing cards and a double lift until you can’t stand it any more… Try to find a method that looks as normal and natural as your ‘real’ action. A good source for learning the double lift is Gregory Wilsons DVD Double Take. When you learn magic tricks, it’s usually in isolation. You practice one trick fully, then go onto the next one. The problem you are facing may be due to lack of act construction. There’s no need to follow a card trick with another. Put the deck away, and move on to a coin trick, or some mentalism. Return back to playing cards later in your set. Breaking up your card magic like this, means you don’t have to worry about decks being ready for multiple tricks. Another popular option is to choose tricks that don’t require a switch. Many gimmicked playing card decks can be used with ‘follow on’ tricks, that will still work with them. You may ruin the stack of the deck, but unless you are table hopping and find it difficult to reset later, then that shouldn’t be a problem. If the gimmick is just a few cards, consider using a clean up device. The product: Any signed card to any wallet is a great trick, but the device will also allow you to remove gaffs and add them to a deck of cards whenever you want, right under the spectators watchful eye. This may be a good solution for you.